Over the years, the American Central Intelligence Agency has gained a reputation for being the most far-reaching, sophisticated, and effective government intelligence agency on the planet. At the same time, the CIA has also become known for its incredible paranoia and propensity to undertake costly, sometimes illegal, and often downright absurd projects in the name of gaining an edge on the competition. 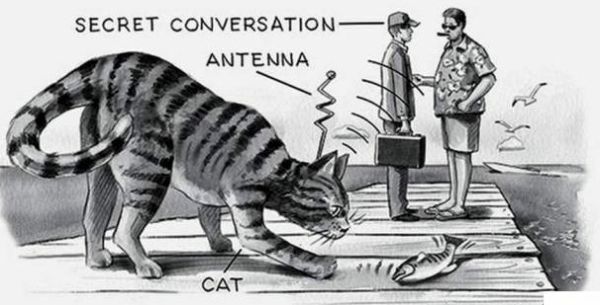 From spy cats to psychic hippies, the following are ten of the weirdest spy programs the government has proposed and funded over the years. One of the most ambitious and downright insidious programs ever launched by the CIA was Operation Mockingbird, a propaganda project that was implemented in the early 1950s. It was a massive undertaking that saw as many as 3,000 CIA agents and collaborators attempt to gain some control of the free press by feeding select groups of reporters information and using newspapers at home and abroad to filter the kinds of stories that got to the public. At its height, the program included writers for the New York Times, Newsweek, and Time Magazine among its ranks, and was said to have a significant influence on as many as 25 major newspapers. The program had a major impact abroad, as well, as it served a major function in helping to sway public opinion in the run-up to the eventual overthrowing of Guatemala’s leftist president. Operation Mockingbird continued to have a major effect on worldwide media throughout the 50s, and it was not until the 60s that a series of reports by investigative journalists brought the program to light. The tapped telephone wires are presented to the press. One of the most audacious intelligence operations of the Cold War was 1953’s Operation Gold, which was a joint effort between the CIA and the British MI6 to hack into the phone lines of the Soviet headquarters in East Berlin. This required the construction of a massive 450-meter long tunnel that would intersect with an underground telephone junction. Just preparing the tunnel took six months, and involved a substantial amount of risk and subterfuge. But when it was done, the CIA proceeded to carefully record as many as 50,000 telephone conversations over the course of nearly a year. The problem? A mole in British intelligence had tipped off the KGB about Operation Gold before the tunnel was even completed, and the Soviets had been feeding fake them information the entire time. In 1956, the Soviets raided the tunnel and shut it down, and the operation eventually caused a great deal of controversy for the American and British intelligence communities. In the early 1960s, when the Cold War was in full swing and fear of communism was rampant, a plan dubbed Operation Northwoods was proposed within the American CIA. In short, it called for the government to perform a series of violent terrorist actions in U.S. cities including bombings, hijackings, phony riots, and sabotage, all of which could then be blamed on Cuba. This would drum up support for a war against the communists and lead to an eventual military operation to remove Fidel Castro from power. The plan was drafted and signed by the Joint Chiefs of Staff and presented to President John F. Kennedy, who personally rejected it, and it was subsequently abandoned. For years after, Operation Northwoods existed as a rumor, but it was finally revealed to be true when top-secret documents describing the plan were made public in 1997 as part of a release of government papers relating to the Kennedy assassination. 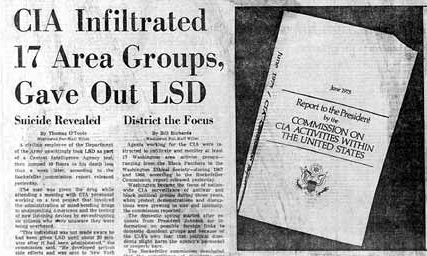 In the early 1960s, the youth culture of America was first beginning to experiment with hallucinogenic drugs like LSD, and so was the Central Intelligence Agency. Operation Midnight Climax was one of the government’s most ridiculous and illegal attempts to test the possible uses of drugs like acid by administering them to unsuspecting citizens. The program was run out of a collection of safehouses in New York and California. Prostitutes were used to lure young men to the houses, at which point they were given food or drink spiked with LSD and other drugs and placed in a room with a two-way mirror where their behavior could be observed. Midnight Climax was essentially an experimental program designed to monitor the possible tactical uses of psychotropic drugs and sexual blackmail in the field, but even within the Agency it was controversial, and it was shut down after only a few years. Most of the files connected to the operation were destroyed, but a few survived, and in the early 70s the files regarding Midnight Climax and many other illegal CIA programs were brought to light in a famous story by the New York Times. The $20 million Stargate Project was a blanket term used to describe a large number of psychic experiments and investigations undertaken by the U.S. government between the 70s and 90s. The biggest goal of the Stargate Project was to investigate the scientific probability of “remote viewing,” which is the psychic ability to witness events over great distances. The program, which also investigated psychic abilities like out of body experiences and clairvoyance, tested subjects on their ability to predict future events and read hidden documents. The Stargate Project usually enlisted the services of anywhere from 3 to 22 subjects at a time, many of whom managed to test with an accuracy rating as much as 15% higher than the norm. Still, although some participants claimed to have correctly predicted major world events like military attacks and hostage situations, the program found that remote viewers and so-called telepaths were still wrong nearly 80 percent of the time, and in 1995 the CIA cancelled the Stargate Project for good. Minutes of Meeting of the Special Group on Operation Mongoose, 4 October 1962, page 1. In the early 60s, communist Cuba became one of the major battlegrounds of the Cold War, and its president Fidel Castro came to be considered one of the most dangerous political figures in the world. After early attempts to overthrow Castro by force failed, the CIA instituted Operation Mongoose, which was a secret war of propaganda and sabotage designed to remove the Cuban leader from power. Operation Mongoose had a remarkably wide scope, and included plans to fake attacks on Cuban exiles, provide arms to opposition groups, and destroy Cuba’s crop of sugarcane. It also included several attempts to either assassinate or discredit Castro in the press, each of which was more elaborate and ridiculous than the next. The Agency considered, among other things, poisoning Castro’s personal supply of cigars, planting explosives disguised as seashells in his favorite swimming spots, and injecting him with a deadly chemical from a hypodermic needle disguised as a pen. Even more bizarre were the plans to discredit Castro in the public eye, which included a proposal to spray a TV studio with hallucinogens prior to one of the leader’s televised speeches, and even planting chemicals in his clothes that would cause his famous beard to fall out. The near-disaster of the Cuban Missile Crisis put Operation Mongoose on hold, and following an agreement between Kennedy and the Soviets, it was more or less abandoned. One of the most downright creepy government programs and the fodder for countless conspiracy theories, Project MKULTRA was a sweeping and top-secret CIA program started in the early 1950s that included experiments in “chemical interrogation” and mind control. In short, MKULTRA was a plan that sought to use drugs, psychological stress, and bizarre interrogation methods to get information, control behavior, and even alter brain function. To this day, much of the information on the project remains classified, but what we do know is that the program involved the testing and interrogation of private citizens—often without their knowledge or consent—in the service of discovering whether or not certain drugs could be used as truth serums. This included giving subjects large doses of LSD, amphetamine, and mescaline, as well as shock therapy. In one case, subjects were supposedly dosed with acid for 77 days straight in an attempt to test the effects of long-term exposure to the drug. Conspiracy theories abound about the real goals of the project, with some saying it was a program to engineer zombie assassins through mind control and brainwashing. Some information about MKULTRA was finally brought to light in the early seventies, when news reports about CIA abuses of power led to a Congressional commission. The project was subsequently shut down, but many people claim that similar CIA programs still exist to this day. U.S. aerial reconnaissance photograph of a medium range ballistic missile launch site at San Cristobal in Cuba, on 1 November 1962 during the Cuban missile crisis. For sheer absurdity, wastefulness, and infamy, few CIA projects compare to 1961’s failed Bay of Pigs Invasion. The program was one of the first and boldest attempts to overthrow communist Cuban leader Fidel Castro, but it was also the most disastrously unsuccessful. It started in 1960, when the CIA, under the authorization of the President, began planning an attempted overthrow of the Cuban government. In order to eliminate any link to the U.S., the attack was to be perpetrated by an army of Cuban exiles specially trained by the CIA. After a series of diversionary air strikes, on April 17, 1961, a group of amphibious troop transports landed on a beach in the Bay of Pigs and began unloading their cargo of 1,300 exile guerrillas. The plan was for them to rendezvous with a smaller band of paratroops to be dropped soon after their arrival, but from the beginning their plan was tragically mistimed. For starters, Cuban intelligence was already aware of the planned invasion, and this meant that when the exile troops landed they were almost immediately under attack. To add to the force’s problems, bad weather, coral reefs, and the Cuban swamps quickly claimed most of their equipment. All told, an estimated 2,000 Cubans died during the invasion, while over 100 members of the exile army were killed in action. The remaining 1,200 were captured and imprisoned, and some were later executed on the orders of Castro. Over a year later, the rest were freed in exchange for $53 million in food and medicine for Cuban people. The effects of the Bay of Pigs were far reaching. Several American officials resigned over their involvement in it, and many have credited it with increasing the resolve of the Cuban government and encouraging a severe distrust of American foreign policy in the years that followed. while the bay of pigs invasion was disastrous, it wasn't a total loss either. at least it taught kennedy some humility and developed in him skills in crisis decision making that was integral to the peaceful resolution of the cuban missile crisis. lol we cubans knew it before. damn we kick a$$!!!!!!!!!!! just go make me a cigar..
Cuban’s were on both sides. I've been reading about some CIA conspiracy stuff lately and after reading this list none of it seems far off anymore. I know it's past Halloween, but if anyone is into those internet legends that get passed around via forwards similar to the Dibbuk box, Ted the Caver and the Dionnea House, I highly recommend checking out the blog indianlakeproject.blogspot.org. It takes some of the real CIA programs mentioned in the above list and weaves a wicked tale about this supposed facility that used to exist in New York that worked on mind control techniques similar to the Manchurian Candidate and MK Ultra. Probably all fiction at its core, but fascinating reading and a great way to waste a day nonetheless. Excellent list! Keep 'em coming! Is there a top 10 top 10s? No, but if there was it would be outdated every week. I have new favorites that often. You are so fond of top tens, show me a scientist who has ever held a top ten position of power in the US. Yes the world is screwed up, because for the most part, people of faith are pulling the strings and calling the shots. Scientists have to feed their families and just plain survive, just like everyone else at the bottom of power pyramid. Scientists in every country of the world are forced to work for mad men or men of faith else suffer the consequences. When evil is done, it falls on the shoulders of the scientist,(the religious leaders giving the orders will generally escape responsibility) though they are not the one's in power. You list some very disturbing research conducted by the CIA, but you neglect to mention that with the exception of John Deutch appointed Director of Central Intelligence in 1995 by President Bill Clinton, (though Deutch was initially reluctant to accept the appointment. )George H. W. Bush (Episcopalian) Stansfield Turner (Christian Scientist), William Casey (Catholic)) James Schlesinger(Jewish), William Webster (Christian Science), James Woolsey (Presbyterian), Robert Gates(Christian Protestant? ), ,George Tenet (Greek Orthodox), Porter Goss (Presbyterian), Michael Hayden (Catholic), and the current head of the CIA Leon Panetta (Catholic) are all men of religious faith and not scientists. And NO, just because one holds the faith of "Christian Scientist" does not make them a scientist ! So please do by all means, show me where scientists left to their own accord have perpetrated evil on humanity. For I will show you how for the most part it was god fearing men with no science background that gave them the orders. NBB, I officially invite you to write a list for this site. You are so outspoken and have a lot say, Think about it. Email me at admin @ toptenz.net if you are interested. It's weird to think that as recently as the sixties (After Operation Mockingbird) the New York Times, Newsweek and Time weren't propaganda machines. Insidious propaganda may be the only thing keeping the Times afloat at this point. oh, that's funny. I was just thinking the same thing about Fox "News." Operation Paperclip just missed making the list. Compared to some of these other programs, it just wasn't odd enough. I don't think I'm familiar with the other two. What did they involve? Yes, give us details or links. Thanks. Stargate #4 dead-ended at 3:42. Why? Top Tenz Master: Suggestion for the site- It would be neat if we could give a thumbs up/down for each comment! Love this site either way thanks! What the CIA has done over the years (and continues to do) in the name of "National Security" is simple treasonous, morally objectionable, disgusting, and simply wrong. I don't understand why people aren't simply up in arms, in the streets protesting and shutting down the government until they remove this scourge (along with the IRS, NSA, and other 'programs' ) which mock us with their 'institutional' and patriotic labels and ideologies. So much of the government's budget – our money – is squandered on this crap day after day, year after year, decade after decade. How many countless innocents have been killed by the CIA over the years? No one knows, but the perpetuation of coercion by violence and intimidation will ultimately fail, and prove to be one of the most damning and effectual in the demise of our civilization. We're doing it to ourselves. "For years after, Operation Northwoods existed as a rumor"
Oh, you mean it existed as a "conspiracy theory" which was mocked a derided by those who trusted their governemnt and knew better, right? I know someone who worked on the USSR psi-ops projects. My partner and this person bonded big time because partner's ex worked on the CIA/MI6 attempts to replicate what the Russians claimed they did. They couldn't do it. This is because a bunch of physicists and philosophers in Siberia made up the experimental results to keep the KGB off their backs while they did proper work. Some of the Western people doing the psi-ops stuff started to believe it was true> Stockholm syndrome. I can provide names to back this up. But why would I do it to one of the nicest people I know, who moved as far away as possible? If number 7 isn't proof of False Flags (ahem 9/11) I don't know what is. Time to dismantle the CIA and get their drugs and corruption out of this country. Fascinating list, I’m sure there are more for future lists, in particular I believe there are some rather interesting tales to be told about the current wars in Iraq and Afghanistan and CIA operations. I know this thread is old and my comments don’t mean much now but I just have to say this. Wow! Some of these comments are as weird as the items listed. Actually, they’re past ridiculous. Like those made by ‘NotoriousBigBrain’ Your ranting is way off base. In most cases scientist are the creators of programs like these. They would theorize these programs, then they’d submit their proof-of-concept reports, brief the programs panel, and, if it were approved for further study they’d perform a concept study which would be used to determine the feasibility of the concept. The people that you say are the ‘God fearing men’ might be the one’s who approve the program for implementation, but nine times out of ten these individuals aren’t the ones who â??conceiveâ?? the program. In the CIA (and other agencies) it would be the people who have masters and doctorates, who call themselves ‘scientist,’ who would be the breeders of this stuff. You know; the people who think they have notoriously big brains. And you people who think that the gov’t has implemented a program like Operation Northwoods and conducted terrorist attacks like 9/11 or the Oklahoma city bombing are lunatics! If this were true don’t you think there would be some gov’t informants…whistle blowers…who’s conscience (or greed) got the better of them? But if you really think there was a conspiracy with 9/11, you’re absolutely right! It started with clinton (lower case intentional). You can read all about it here: http://www.apfn.org/apfn/knowledge.htm. But what’s not a conspiracy is the believe that the U.S. Gov’t (under Bush or any other president) committed the deed. You’re just plain ignorant and stupid (ignorpid) to think such a thing. But ya know what, if the gov’t had done it…the idea would have been conceived by scientist! The big brain type. Operation Paperclip should be on this list (though it was not really a full CIA program). Importing german scientists (many ex nazis) to the US after WWII was one of the most important operations conducted in the 20th century. Besides the ethical dilemma that exists in importing ex nazi scientists and pardoning them of all war crimes, there is also the fact that many of these German masterminds went on to help shape the science and technology america has today. Classic example is wernher von braun, the creator of the v2 rockets (also a member of the ss). Von Braun also went on to help start NASA and helped to engineer the space program that landed us on the moon. The fact that so many nazi scientists (some criminals, others not) were imported to the US without trial or much speculation makes operation paperclip quite an operation to me.